The Pentagon has decided to end operations at an airbase in Britain and 14 other sites in Europe in a bid to save $500 million annually due to tight budgets and a shrinking military. The US said on Thursday that it would end operations at RAF Mildenhall, located northeast of London. The base is home to tanker, reconnaissance, and special operations aircraft. RAF Mildenhall was used as a transport hub for US troops. The US will withdraw 3,200 military personnel and their families over the next few years. The net loss of US troops in Britain will be around 2,000, the Pentagon said. Its 352nd special operations group will reportedly move to Germany, while RC-135 reconnaissance planes will stay in the UK. The Pentagon is reportedly under orders to reduce projected spending by nearly $1 trillion over a decade. US Defense Secretary Chuck Hagel said US troops will leave RAF Mildenhall in Suffolk, along with RAF Alconbury and RAF Molesworth in Cambridgeshire. 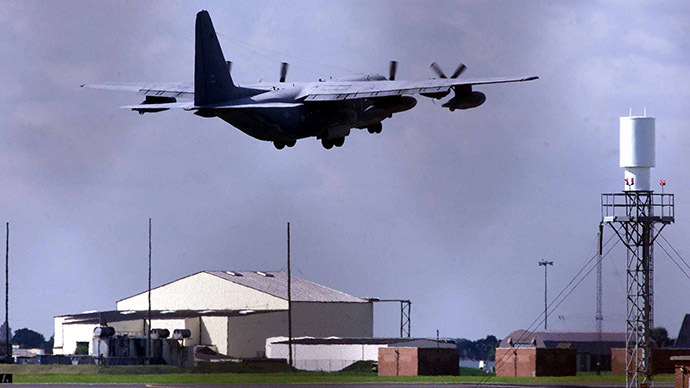 Closing RAF Mildenhall will lead to an estimated loss of 1,300 military and civilian posts. Around 2,600 personnel are expected to be relocated to other bases in the UK, and to Ramstein and Spangdahlem airbases in Germany. “We understand these changes will have substantial impacts on the local areas, but we are dedicated to working closely with our community neighbors, defense partners, personnel and families to ease the impact of these transitions as much as possible,” General Frank Gorenc, commander of US Air Forces in Europe and Air Forces Africa, said. However, the Pentagon is planning to add 1,200 personnel and two squadrons of F-35 Joint Strike Fighters at nearby RAF Lakenheath in 2020, which will reportedly compensate for the closure. RAF Lakenheath is home to the US 48th Fighter Wing. Europe is a critical platform, says Chollet. "Maintaining a strong robust presence in Europe is vital to our national security interests." British Defense Secretary Michael Fallon has welcomed the US decision to base its new F-35 fighter at RAF Lakenheath in Suffolk. The US has around 67,000 personnel stationed in Europe – most in Germany, Italy, and Britain.